Victor contacted us last week to get a logo created for his business. He was immediately ready to start and had an idea of what he wanted. Our logo designer worked on the logo and had a few mock-up designs to him with a few days. Victor liked one that he made and requested a couple of small modifications to it. The logo was completed and approved yesterday! Jay contacted us in mid-November asking to create a logo for their hunting group. He provided specific drawings of ideas that they were looking for. Our logo designer provided a mock-up design to Jay initially – and then some additional drawings were provided to help steer the logo design. We then provided two additional mock-up designs and Jay was ecstatic with one of them – with just a few small modifications. The logo has been completed and Jay plans to have it printed on shirts for their club. I am appreciative of your willingness to listen to our ideas and your response time is fantastic. I’d like to do my part in letting others know about you guys and your 5 star customer service. We appreciate the business from Jay and hope that we will receive other work from him in the future! Carol, the owner of Balanced Body and Wellness, contacted us about a month or more ago to have a logo created. 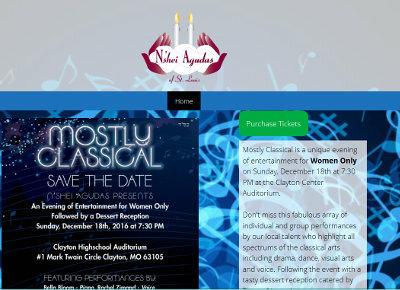 Upon the creation of the logo and the service we provided, she wanted to also have us assist with her website needs. Carol already purchased a domain name and setup hosting at the WordPress.com website. However, after working with her more, she opted to have the domain name transferred to us along with the website hosting. Once this was completed, we got the majority of Carol’s website done within 24 hours. After some modifications, the website was completed and made live today. We appreciate Carol’s business and look forward to serving her in the future! The website for Balanced Body and Wellness is at balancedbodyandwellness.com. Neil, the owner of Custom Blind Service, contacted us a few weeks ago about some website needs. Primarily, he wanted to add a statement at the top of his website with a special offer he had for new customers. After the holidays, he got back with us and said he was ready to move forward with the placement of the statement at the top of his website. During our communications, he also expressed concerns about his prior website designer and if they ‘cleaned up shop’ with the site. When he searched for his site in Google, he found that some of his links coming up were still pointing to his old website, which should have been removed. Neil did reach back out to his prior web person and they backed up the old website – which effectively removed those pages from the Internet. However, if someone were to go and do a search, the pages were now coming up as “404 Not Found”. This isn’t good – because it could deter potential customers and cause them to think he went out of business. The first order of business was to get the statement added to the top of the site. It was placed under his menu navigation to ensure maximum visibility on all pages of his website. After this was completed, we then had to do some work to make his individual town pages more search-engine friendly. They were initially only setup as “Bethesda” as a title of the page (as an example). We changed it to “Bethesda MD Custom Blinds”. This was done on all 16 of his town web pages. Once this was done, the website needed to have links pointing to these pages for the search engines to find. We created a new drop-down menu in his navigation that says “Locations Served” and added links to each of those town pages. And finally, we completed the whole process by putting in “redirects” from his old web pages to the new town web pages. By doing so, if someone were to click on one of the old links still showing up in the search results, they would be automatically redirected to the new web page for that town – instead of getting a “Not Found” error message. 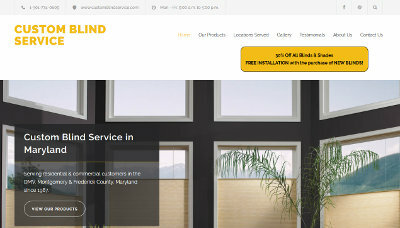 The Custom Blind Service website is at customblindservice.com. Daniela was referred to us by another customer of ours about getting a simple website created. She simply wanted a site that would have a poster of an event they have coming up – with the ability to link to Eventbrite for online ticketing. Once we received the poster and the Eventbrite link, we had Daniela’s website completed within 24 hours. We appreciate the business from Daniela and N’shei Agudas of St. Louis! Their website is at nsheiagudas.org.